I just spotted (hehe) this amazing Leopard-print coat at ASOS! It’s part of their Kate Moss collection. A mid-length coat with wide lapels — it’s just shot straight to the top of my Must-Have List! It looks like the perfect Autumn coat to me, and I imagine it with a studded clutch bag or a cutey hard case purse! Indian Fashion Week was held back in March, and we’ve just noticed that one of the fashion houses Lecoanet Hemant was using New Zealand Possum fur in their collection! Here’s a link to the article from Yahoo! India. They had a range of Possum fur jackets in their collection, although the picture in the article is of an après-ski hat in white Possum fur. This looks quite similar to our very own KGB hat. It’s nice to see Possum being utilized in markets other than our own. It’s also very interesting fur because it’s the only one you can wash in a machine. Please, whatever you do, DON’T wash your Possum fur in the machine! You can gently wash Possum Merino yarn, but I would never recommend washing a Possum garment or scarf. If you’re unsure but would like to see some fur care instructions, have a look on the Possum NZ website. No sooner had I made my post about the ‘Bigfoot Possum’ on Friday, than I got home and found this follow up article in the local rag – the New Zealand Herald. Researchers put their Bigfoot in it. Melted into a ball uncharacteristic of hair. The thawing was speeded up and the exposed head was found to be “unusually hollow in one small section”. An hour of thawing later and the feet were exposed – and found to be made of rubber. Apparently they submitted three DNA samples, one was inconclusive, one was human and the other was Possum. According to the men, their Sasquatch corpse was over 7′ tall and weighed 500 pounds. They released a photo in July that shows what appears to be a cooler full of dirt mixed with some entrails and what look like some dentures on top for good measure. And a link to the photo, which looks like Chewbacca chillin’ in a polystyrene spa pool (or, a Styrofoam jacuzzi, for our North American friends)! It’s been a little while since I’ve done a possum fur throw in a funky colour like purple (usually the naturals/browns/blacks are more popular), so it was nice to be able to whip this one up! This batch of hides was pretty scrummy, and you can really see the texture in the fur. What do you think? Just click the image to see a larger version. A couple of months ago we got an email from Whakamarama School (just out of Tauranga in the Bay of Plenty), who told us about the ‘Possum Hunt’ and family fundraiser they were running, to update their IT equipment. Held at the beginning of June, we hope the fundraiser was a huge success! From the photos we saw it looked like the weather was fantastic. It sounds like it was a great day with ‘wild food’ stalls – Venison, Goat and Possum pies, and amazing-sounding Duck sausages! One of the Possum NZ staff (who shall remain nameless) was all in favour of hopping in the car and driving down for a special West Coast Possum pie! Possum New Zealand was pleased to help out, and donated a hot pink Audrey Hepburn fur scarf as one of the prizes. Special thanks to George Creighton-Syme who told us all about going Possum hunting with his Dad! On Friday and Saturday me, Dad and Dad’s friend Seth went possum hunting. We caught 85 possums. In the bush it was dark and scary. The possums were squealing, the pigs were oinking, but the Morepork were crying “more pork, more pork”. Bang went Dad’s gun. Squeak went the possum. That’s 84 possums. Bang went Seth’s gun. Squeak went the possum. That’s 85 possums. We better get home, it’s getting late, it’s almost midnight. The next day Dad and I went to the Whakamarama school possum hunt competition. We came second. My friend Zinzan came first. I’m going to beat Zinzan next year. With all the talk of carbon emissions we’ve been looking into ways to reduce our carbon footprint. Possum New Zealand’s already committed to recycling (both waste and stock), but we’ve been looking at how making small changes adds up to the greater whole. We’ve always recycled our scraps of Possum fur for trimming eco-bags (made from recycled plastic), making pompoms, stuffing cushions and our cute Possycat toy. Our Possum Merino T-Cozy hat was created solely to utilize leftovers from the knitters. In the office it’s things like: not running the air conditioner, turning off computers and other devices at the wall and turning office lights off when we’re not using them. This got us thinking about how Possum’s negatively impact our carbon footprint. We heard them called ‘carbon junkies’ the other day, because of the amount of vegetation they destroy. One fully grown tree can absorb over 20kgs of Carbon Dioxide every year. When you think that Possums are munching through 20,000 tons of bush every night (!) you realise what a problem this is! Trees are the cheapest, and one of the most effective ways of removing Carbon Dioxide from the atmosphere, not to mention returning Oxygen. By removing Possums from the eco-system, we’re protecting the native fauna from an introduced predator, AND increasing carbon storage from the atmosphere, as the trees continue to grow. That alone is a persuasive argument for a commercially-driven eradication plan, especially when you consider that around 30% of New Zealand (8.2 million hectares or over 20 million acres) is forest anyway. Opponents of 1080 poison have always argued that it not only kills the Possums, but other species as well. We know that there is some impact on other species, but the major threat to most New Zealand wildlife is from predators, such as possums, stoats and rats. It appears anti-1080 lobby groups fears are being realised. Following a recent 1080 drop on the West Coast, seven Kea parrots died. A protected species, there are fewer than five thousand Kea’s left in the wild. There have also been recent reports of farmed Deer and domestic animals being poisoned. 1080 poison (or Sodium monofluoroacetate) is dropped in pellet form into New Zealand’s rugged backcountry to control the spread of pests. It works by stopping animals from producing energy from food. They then die from heart or respiratory failure. Aerial 1080 may well be a significant threat to the kea population with some drops probably devastating. There has been recent concern of the actions of 1080 protestors with an animal control officer’s dog being poisoned and 1080 poison being sent to some government agencies. This is an issue that seems to stir up a lot of emotion – on both sides of the coin. Many are concerned that the indiscriminate aerial drops of 1080 pose a major threat to our endemic fauna, not to mention the potential for poisoning the water supply and threatening our ‘clean green’ image. 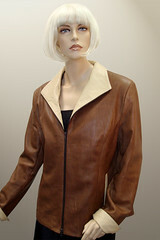 One of my clients asked me to ‘jazz-up’ a leather jacket that she wasn’t happy with. I had some Australian feral Fox that I’d been wanting to work with, and I thought it worked perfectly with the tan leather. I especially love the white tips on the hides. They provide a lovely contrast with the rest of the golden-syrup coloured fur. Just like on a make-over show, you can see the before and after photos below! Congratulations to Belinda Whitehead of Wellington, New Zealand. Belinda won our July prize draw for a Possum Merino T-Cozy hat valued at NZ$56.00! 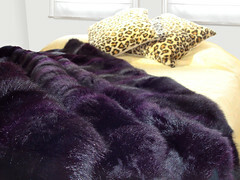 This months prize is a natural brown Possum fur hide — perfect for your crafts projects, or just to drape over the couch!